DB Cargo UK transported the luxury Belmond British Pullman parlor car through the Chunnel. The first time historic carriage has ever taken journey through Channel Tunnel. Intermodal move leveraged DB Cargo UK’s connections across the European rail network. DB Cargo UK has transported the luxury Belmond British Pullman parlor car Phoenix through the Channel Tunnel – the first time that such an historic carriage of its type has ever taken this journey. The parlor car, which was a favorite of the Queen Mother and also used by General Charles de Gaulle, was moved by DB Cargo UK from London to Dollands Moor in Kent and then through the Channel Tunnel to Calais Frethun Yard, before being transported by sister company ECR to Clermont-Ferrand in Southern France. The coach was moved there to undergo an internal restoration and external overhaul at a specialist workshop in the area. The final section of the journey to the workshop was completed by the French operator Fret SNCF. “An historic coach like Phoenix has never been taken through the Channel Tunnel before and at first it seemed that it might be virtually impossible to take a parlor car dating back to 1927 through such modern infrastructure, so we knew we had a great challenge ahead of us,” said Richard Corser, an account manager at DB Cargo UK. The team at DB Cargo UK worked quickly and diligently to find a solution. They arranged for the coach to be transported on a regular intermodal service that moves bottled water between England and France, knowing that this would be a safe and dependable solution. 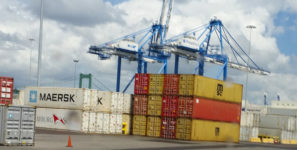 Phoenix was transported in March along with empty containers as the service returned to France, also making it cost-effective, efficient and environmentally friendly. “This achievement demonstrates the value of DB Cargo UK’s connections across the European rail network and showcases the full logistics solutions we can offer to our customers,” said Corser.